Primary amoebic meningoencephalitis (PAM), caused by Naegleria fowleri, is a rare protozoan infectious disease in China. A fatality rate of over 95% had been reported due to extremely rapid disease progression in the USA and other countries. Rapid and precise identification of the causative agent is very important to clinicians for guiding their choices for administering countermeasures in the clinic. In this report, we applied the next-generation sequencing (NGS) method to rapidly show that N. fowleri was the causative agent of a fatal case involving a 42-year-old man with severe PAM disease, the first reported in mainland China. A 42-year old male in a deep coma was admitted to Shenzhen Third People’s Hospital, a special medical care unit with expertise in infectious diseases. Increased intracranial pressure was detected. The cerebrospinal fluid (CSF) sample was found to be red and cloudy with increased leukocyte and protein levels. While bacterial cultures with CSF were negative, N. fowleri was determined to be the causative agent with NGS. Amphotericin B (AmB), a drug with anti-amoeba activity, was used immediately, but the treatment came too late and the patient died 2 days after the NGS confirmation. In this paper, we reported a case of PAM disease for the first time in mainland China. NGS was used for rapid diagnosis and provided guidance for prescribing medications. However, the patient died due to a late admission amid advanced PAM disease. Early detection of N. fowleri is necessary in order to select effective drug treatments and control the disease progression. Despite the negative survival outcome, NGS was shown to be a promising method of rapid and precise identification of N. fowleri. Primary amoebic meningoencephalitis (PAM) is an acute and rapidly fatal disease of the central nervous system, caused by infection with Naegleria fowleri, a thermophilic free-living amoeba found in warm freshwater such as lakes, ponds, rivers and hot springs . Contaminated tap water could also be a source of infection . N. fowleri usually infects people through the nose cavity when in contact with contaminated water. N. fowleri is commonly known as a “brain-eating amoeba” because of its induction of severe encephalitis in the brain upon infection, with a fatality rate of over 95% . There are over 40 species of Naegleria, but only N. fowleri infections results in PAM . PAM has a rapid, acute disease progression, with an incubation period varying from 2 to 15 days, and death typically occurring 3–7 days after the onset of symptoms . N. fowleri has been reported worldwide including America, Australia, Thailand, Hong Kong and Taiwan , and about 300 cases in total have been reported in 50 years since the first case was reported in 1965 . Prompt diagnosis is important in order to start treatment as soon as possible. However, prompt diagnosis is not easy for those who had no experience in treatment of N. fowleri infection and PAM is often misdiagnosed because no distinctive differences in diagnosis exist to distinguish PAM from bacterial meningoencephalitis . In this study, we report using the next generation sequencing (NGS) method for prompt diagnosis of a N. fowleri-related infection, the first case in mainland China. On 20th August 2016, a 42-year-old man with a fever (38.4 °C) was admitted to a local hospital in Hangzhou City, China. He lived in Shenzhen City, but was visiting Hangzhou at the time. His disease began with a headache 1 day earlier. Upon admission, blood tests showed a leukocytosis of 10.48 × 109/L (80% neutrophils). On the night of admission, a lumbar puncture showed high levels of white blood cells (WBCs, 1170 cells/ μL, 83% neutrophils), a protein concentration of 3.0 g/L and a glucose concentration of 1.0 mmol/L in the cerebrospinal fluid (CSF) sample. He was treated with 2.0 g of the antimicrobial ceftriaxone and his situation was not improved. One day later, the patient’s speech became incoherent and he experienced dyspnea. He was transferred to the intensive care unit and endotracheal intubation was applied. He was administered combined therapy comprising of antibiotics (meropenem and linezolid) and an anti-inflammatory drug (dexamethasone). During the night, the patient was found in a coma with dilated bilateral pupils. Computed tomography scans of his brain illustrated hydrocephalus, cerebral edema and foggy brain ventricles. 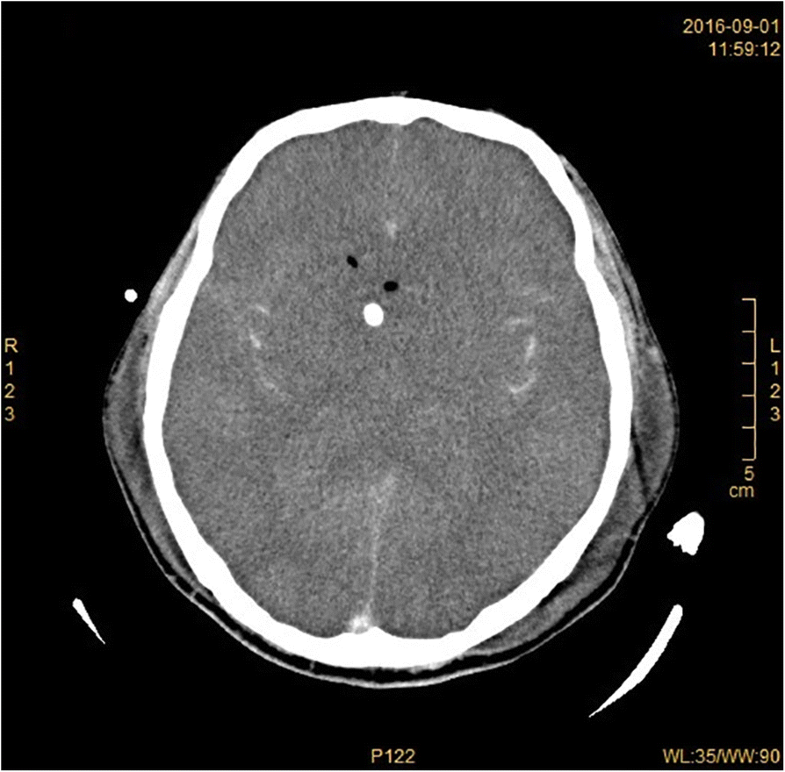 Ventricle puncture for external CSF drainage was performed to reduce intracranial pressure. Four days after admission, microbial culture results of the CSF samples were negative for bacteria and fungi. On 31th August, the patient was taken back to Shenzhen at the request of his family, and transferred to Shenzhen Third People’s Hospital, the key institute for handling infectious disease cases. At the time of admission, he was already in a deep coma and unresponsive to simple cues. A blood test showed a leukocytosis of 14.72 × 109 /L (93.3% neutrophils). The CSF appeared light red in color and was mixed with cloudy debris. The WBC count in the CSF had increased substantially to 52,860 cells/ μL (79% lymphocytes), whereas the protein level had increased to 49.96 g/L and the glucose concentration was 0.11 mmol/L. Computed tomography scans showed severe brain swelling. The shape of the cerebral ventricles had become twisted and almost disappeared (Fig. 1). 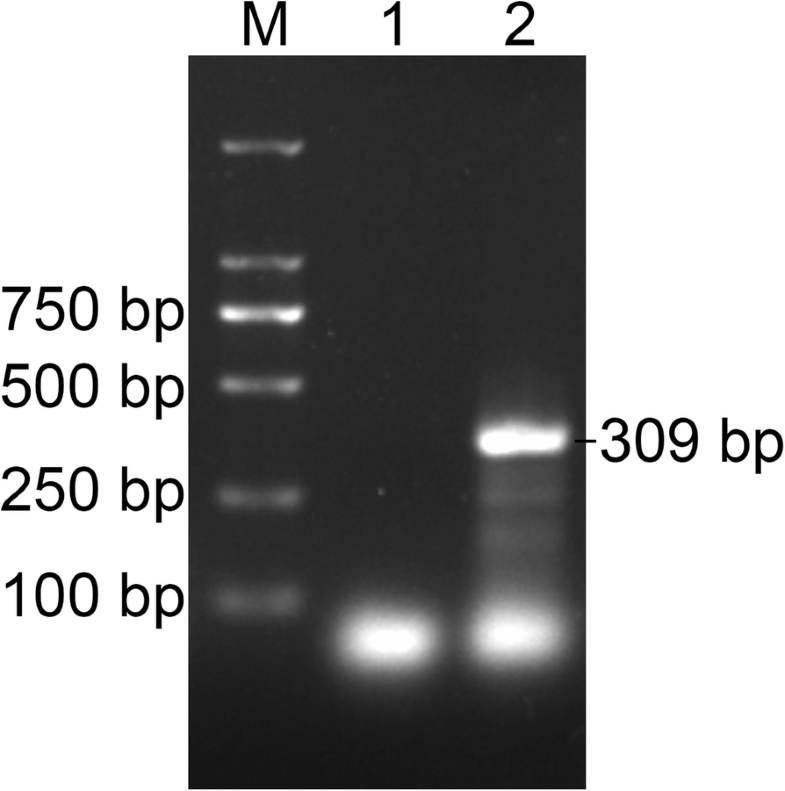 His CSF sample was immediately sent for pathogen detection by NGS at BGI-Shenzhen. Briefly, the CSF sample was centrifuged at 10,000×g for 10 min and the precipitate was used for nucleic acid extraction using the QIAamp DNA Mini Kit (Qiagen), following manufacturer instructions. NGS was performed on the newly developed BGISEQ-500 platform . The sequencing detection identified 65,658 (out of 246,938,950) sequence reads (0.0266%) uniquely corresponding to the N. fowleri genome (Fig. 2b) , and these reads covered a high percentage of the genome (Fig. 2a). 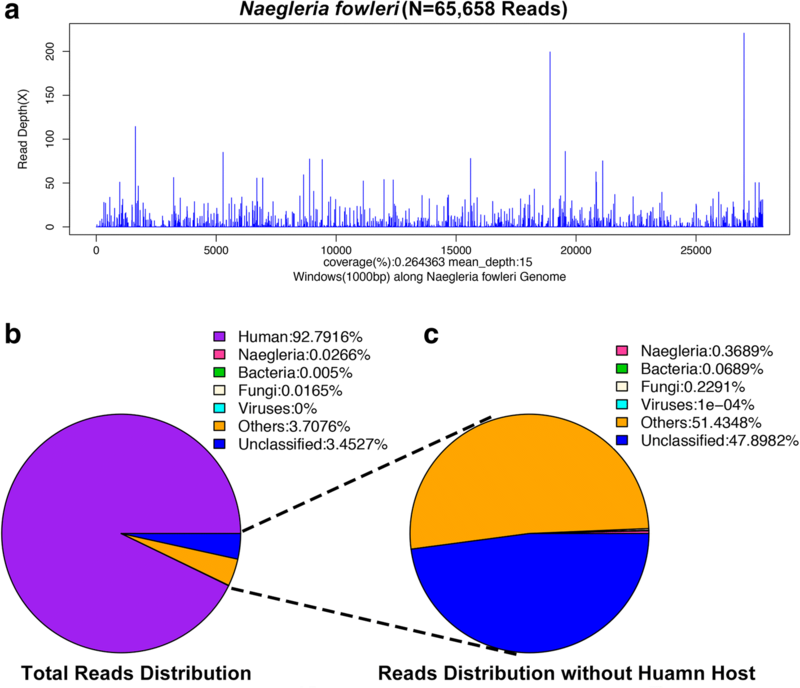 When the reads from the human host were excluded, N. fowleri reads were comprised the most of any microbial species, accounting for 0.3689% of total microbial reads and unknown or unclassified reads (Fig. 2c), and more than the total reads of bacterium or fungi (Additional file 1). A 1.6-kb consensus sequence of the 18S ribosomal RNA of N. fowleri was assembled (GenBank accession no.KY062165) and found to be 99.99% identical to a reference N. fowleri sequence (GenBank accession no. U80059). N. fowleri infection was confirmed by PCR (Fig. 3) using the specific primers NFITS-FW (TGAAAACCTTTTTTCCATTTACA) and NFITS-RV (AATAAAAGATTGACCATTTGAAA) covering the 5.8S ribosomal DNA and internal transcribed spacer 2 . Therefore, all these results indicate that the patient was infected with N. fowleri. In addition, patient history collected from family members showed that the man was splashed by lake water when he attended the Water-Splashing Festival in Shenzhen approximately 1 weeks before symptoms onset, which may be the source of infection. Anti-amoebic drugs including amphotericin B (AmB) at 50 mg/day and fluconazole 0.4 g/day were immediately administered. Unfortunately, symptoms did not improve and the patient’s family requested to cease medical treatment 2 days later. Life support was withdrawn and the patient was pronounced dead on 3rd September. We report here a fatal case of PAM caused by N. fowleri infection, in which infection likely occurred after the patient had direct contact with lake water 2 weeks before the onset of symptoms. This is the first case of N. fowleri-related PAM reported in mainland China. Only two cases were report in Hong Kong and Taiwan, respectively. Although three suspected fatal PAM cases in mainland China had been documented in Chinese journals during 1978, 1990 and 2001, respectively (Table 1), the causative pathogen was never conclusively identified. Increased levels of leukocytes and protein, and a decrease in glucose levels, were consistently observed in all six cases during the disease course. Amoebic trophozoites were observed in the brain tissue after death. Amoebic trophozoites were found in the CSF after death. Amoebic trophozoites were detected in the CSF before death. Amoeba were observed in an abscess biopsy. Amoebic trophozoites were detected in the CSF. PAM is acute and aggressive, with death typically occurring 3–7 days after onset of symptoms. Early diagnosis and rapid treatment with the appropriate drugs are key factors for effective therapy. In the current case, the man had a suspected incubation period of 5 days and died 15 days after disease onset. Although N. fowleri was identified in only 2 days after his admission to Shenzhen Third People’s Hospital, the patient was already in a comatose state, indicating advanced, severe illness. Anti-amoeba medical treatment was initiated 11 days after the onset of disease symptoms; therefore, treatment with the appropriate drugs likely occurred too late to abate the acute phase of PAM. NGS played a critical role in the accurate diagnosis of N. fowleri in the present case. By contrast, the amoeba was not identified in culture. Therefore, NGS constitutes a rapid and accurate method for the identification of pathogens and is particularly helpful in the diagnosis of diseases with unknown causes. Although no clinically approved specific drugs were available, AmB and miltefosine were reported in successful treatment of N. fowleri related PAM. AmB, which is a common drug in clinic and is primarily used as an antifungal medication, has an amoebicidal effect and has been used to treat PAM since 1970. However, the recovery rate with AmB is only 5% (15 recoveries/300 cases worldwide), and this drug can be toxic to humans . Miltefosine, a drug developed against breast cancer and Leishmania infections, possesses activity against free-living amoeba species in vitro [8, 9], and is now recommended for the treatment of PAM by the Centers for Disease Control and Prevention in the USA , while is not currently available in China. In the United States, 143 PAM cases have been reported, with only four survivors between 1962 and 2016 [11, 12] . Notably, two of the four survivors were related to miltefosine treatment. In 2013 an American girl was diagnosed as PAM about 36 h after symptom onset and was given the recommended miltefosine therapy. She recovered completely without any neurologic impairment . In contrast, an 8 years-old boy was identified with PAM more than 3 days after disease onset. He survived with brain damage although he was also given the recommended miltefosine therapy . Although miltefosine-containing treatment regimen could offer a survival advantage for patients with fatal infections by free-living amoeba, recovery is not assured, since at least three fatal PAM cases were also reported with receiving miltefosine treatment [14, 15]. In addition, miltefosine should be administered in combination with AmB and other drugs, such as rifampin and fluconazole, as soon as possible after diagnosing PAM. In addition to drug treatment, physical procedures like CSF drainage, hyperosmolar therapy, moderate hyperventilation and hypothermia have been employed in the treatment of PAM [3, 16]. Although PAM is a rare disease in China, the rapid disease process and very high fatality rate make it a very dangerous disease. Unfortunately, we have no data about the distribution range of the pathogenic N. fowleri in mainland China. More related research should be carried out to analyze the epidemiological risk of N. fowleri in China. On the other hand, development of more specific drugs against N. fowleri should be put on schedule. Most previous cases of PAM have been found to have been infected with N. fowleri during recreational activities involving freshwater . In the current case, the patient participated in a Water-Splashing Festival several days before the onset of disease; it is therefore likely that contaminated water was the source of infection. This case is a warning that care should be taken when participating in recreational activities involving freshwater due to the possibility of contamination. In the current report, a N. fowleri-related PAM was rapidly diagnosed using NGS. Although the patient died, the NGS method was shown to be of use to rapidly identify the causative pathogen in the clinic, especially for PAM. The NGS method should be more widely applied in clinical practices, helping physicians on diagnosis and advising on choice of medical countermeasures in the clinic to save lives. Qiang Wang, Jianming Li and Jingkai Ji contributed equally to this work. This work was supported by the Shenzhen Science and Technology Research and Development Project (JCYJ20160427151920801 and JCYJ20160427153524391), the Shenzhen Healthcare Research Project (201601029), the National Science and Technology Major Project (2016ZX10004222). G.F.G. is a leading principal investigator of the NSFC Innovative Research Group (81621091). Y.B. is supported by the Youth Innovation Promotion Association of Chinese Academy of Sciences (CAS) (2017122). The funders did not play a role in the design of the study and collection, analysis, and interpretation of data and in writing the manuscript. The N. fowleri18s ribosomal RNA sequence assembled using the NGS data was submitted to GenBank (accession no.KY062165). Other microbe reads including that of bacterium, fungi and virus were listed in Additional file 1 (Excel table). QW, JL and JJ contribute equally to this paper. QW wrote the manuscript. QW, LY, LC, RZ, YY and HZ collected and treated the CSF samples. JL and JY were the physicians who treated the patient and provided professional comments to the manuscript. QW, YB, GG, JM and YL analyzed the clinical data. JJ, LL and JM analyzed the NGS data. All authors have read and approved the final manuscript. Written informed consent was obtained from the patient’s family member for publication of this case report. A copy of the written consent is available for review by the Editor of this journal. Fang C, Zhong H, Lin Y, Chen B, Han M, Ren H, et al. Assessment of the cPAS-based BGISEQ-500 platform for metagenomic sequencing. GigaScience. 2018;7(3) https://doi.org/10.1093/gigascience/gix133. CDC-USA. Investigational drug available directly from CDC for the treatment of infections with free-living amebae. 2013. https://www.cdc.gov/mmwr/preview/mmwrhtml/mm6233a4.htm?s_cid=mm6233a4_e. Accessed 8 May 2018. CDC-USA. Naegleria fowleri — case report data & graphs. 2016. https://www.cdc.gov/parasites/naegleria/graphs.html. Accessed 8 May 2018.